With the Pacific Northwest’s superb growing climate, fall is a great season to plant something. I can remember when garden centers would essentially close their doors at the end of September and not re-open until February. The belief was that there was not enough business generated to warrant staying open during this time period. Some would reopen for the Christmas season to sell trees and wreaths and then close again for the month of January. Certainly the times have changed and many garden centers have become very innovative in creating events to draw in families in this so-called “off season.” For example, there are now apple and tomato tasting events and Halloween events, both of which often draw huge crowds. I have also noticed that there is an increase in fall gardening. It is not a huge increase, but fall gardening seems to be experiencing an upswing. Fall gardening has often been relegated to the planting of bulbs such as tulips, daffodils, crocuses and hyacinths. But with our superb growing climate, there are many trees and shrubs that can also be planted in the fall to provide fall color. The color provided might not be from the flowers, although it often is. When it isn’t, it can be in the form of fruits, berries, foliage, bark or a combination of any of these. The crowds generated by events such as apple and tomato tastings, and Halloween, create a perfect opportunity for a garden center to have displays of plants that exhibit fall interest. In order to encourage garden centers to make such displays and give gardeners ideas, I have selected a few plants that will hopefully be unfamiliar to many gardeners. Arranging such fall displays would present garden centers with the perfect creative opportunity to show gardeners what they can accomplish at this time of year. A favorite small tree in my garden that I think deserves to be better known is Euonymus europaeus ‘Aldenhamensis’, aka European spindle tree. In the spring this tree has rather non-descript clusters of small white flowers. Throughout the summer, it has rather ordinary green leaves that are not particularly showy. Then in the fall, fruits that are like candy for the eye appear on the somewhat pendulous branches. The small fruits are brilliant pink outside and then open to show orange berries. If that is not enough, the fall leaf color turns to a brilliant fuchsia before dropping. And once the leaves have fallen, the fruits often remain on the bare branches until the birds have eaten them. The tree in my garden is perhaps 20 years old, has never shown any insect or disease damage and is a very low maintenance plant. Another small tree that deserves to be better known is Heptacodium miconioides, aka seven-son tree. This is a deciduous tree that in late summer has creamy white clusters of fragrant flowers followed by rosy calyxes surrounding the tiny, nondescript fruits. However, what makes this a great interest plant in the winter months are the tan strips of bark that shred away to reveal a deep mahogany bark underneath. This tree is a very easy care, low-maintenance plant that reaches 20 feet in height and may be equally as wide. It is also easy to prune. There are so many selections of crape myrtle (Lagerstroemia) that it can be difficult to make a decision if one only has space for a single plant. For many years, they tended to be prone to powdery mildew here in the Pacific Northwest, as well as not blooming until late in the season. However, most of the new selections on the market are resistant to powdery mildew. They will start flowering in July and often continue through September. An added bonus is that since crape myrtle blooms on new growth, the plants can be pruned in winter or early spring if size is a consideration due to space. The flower colors range from white to lavender to shades of pink and almost red. There is a new series with foliage that is very dark, almost black, which can provide a nice contrast to a green background. In the winter, crape myrtle is known for its uniquely colored exfoliated bark, which can create a focal point at night with a spotlight at the base and shining upward. Another colorful fall plant is the viburnum. Some viburnums produce wonderful, brightly colored berries in the fall ranging from yellow to gold to red to black. Usually considered small to large shrubs, many viburnums are evergreen and height can vary greatly. Garden writer Barbara Blossom had a friend give her a seedling of Viburnum opulus ‘Xanthocarpum’, which is known for its yellow-gold fruit in the fall. Obviously her seedling did not know that it was supposed to have yellow fruit, and she has a 6-foot shrub in her garden that is loaded with red berries. 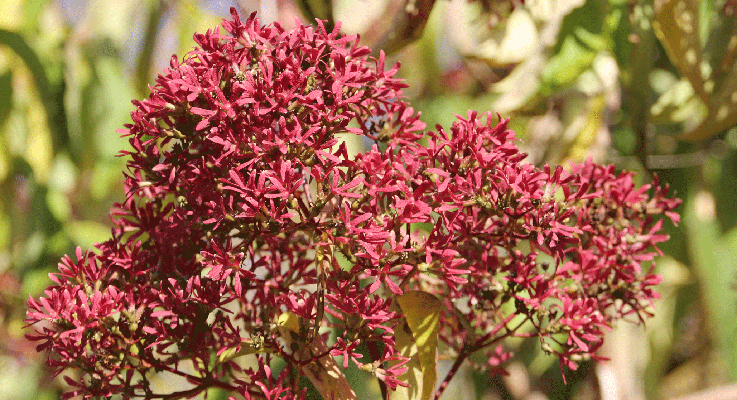 Clerodendron trichotomum is often referred to as the peanut butter tree due to the fragrance that is emitted when a leaf is crushed. This tree is a mid to late summer bloomer that has clusters of small fragrant white flowers. However, the attribute that makes this tree a superb fall garden choice is the fruit that appears after the flowers. The metallic-looking turquoise fruit is surrounded by fuchsia-colored calyxes that remain on the tree throughout the fall. While hydrangeas are primarily noted for their spectacular flowers in late spring and summer, some varieties also provide great fall color. One example is Hydrangea paniculata ‘Fire and Ice’. The flowers begin in the spring as cream colored. As the season progresses, they change to light pink, and by the end of summer, the flowers tend to be dark pink. These blossoms hold their color and often last through the early fall. Many of the oak leaf hydrangeas also offer beautiful fall color through the leaves and the exfoliating bronze bark. There are many additional plants that fit into the palette of fall color. My suggestion to retail garden centers is to make the most of the opportunity to showcase some of these plants in a prime location in your store. If you are having an event that is primarily indoors or away from the actual location where plants are located, create a display in a high traffic area where people will see it. Many gardeners are not actively looking for plants at this time of year, and even if they are coming to an event, buying plants is probably not on their mind. A little nudge never hurts! One person’s nudge can often become another person’s inspiration.